I promise that underneath everything here, there are actual wedges of chilled iceberg lettuce..and.. it's all vegetarian! I used my cracked pepper bleu cheese dressing to dress up this Loaded Wedge Salad. 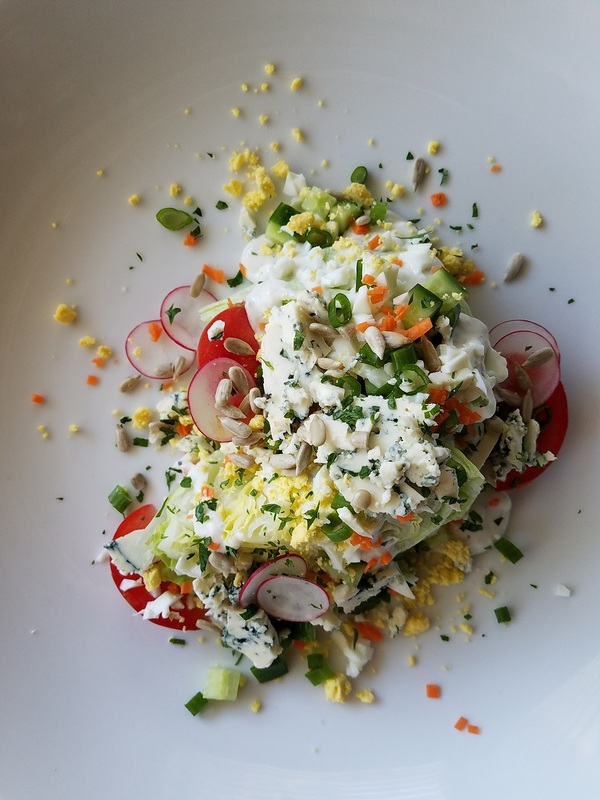 Fnished with Bleu Cheese, Cucumber, Tomato, Carrot, Parsley, Scallion, Hardboiled Egg, Radish, Sunflower Seed. Put this on the table for your New Year's Eve Party, you could even do individual wedges! Combine ingredients in a medium mixing bowl and mix with a whisk/spatula. Season dressing with salt to taste. Refrigerate for 30 minutes to combine flavors. Dressing can keep refrigerated for up to 3 days. 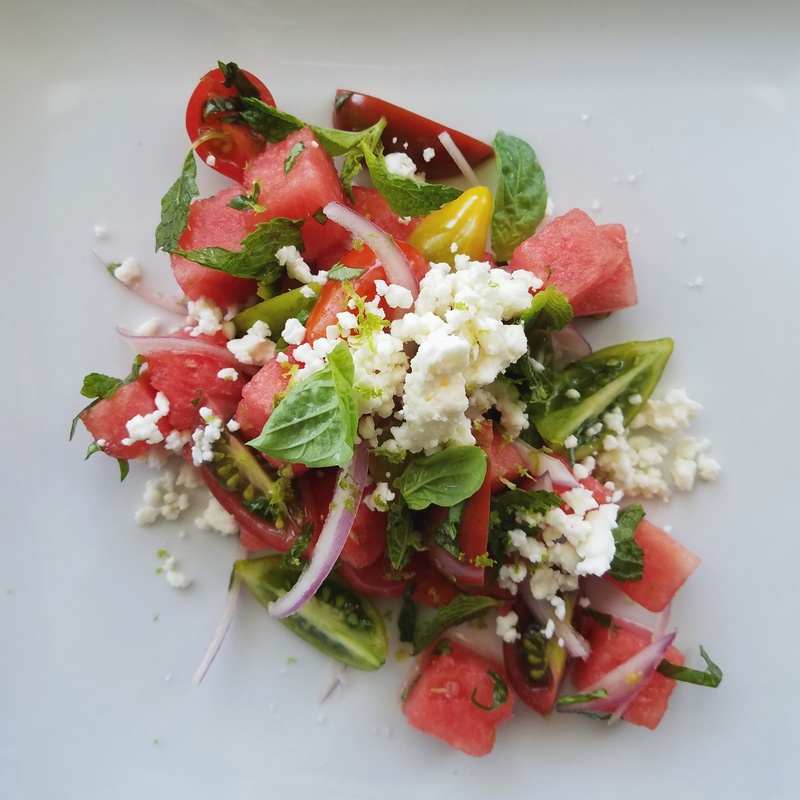 This Simple Tomato Salad is just that, simple. But please, do not percieve it as a boring salad. 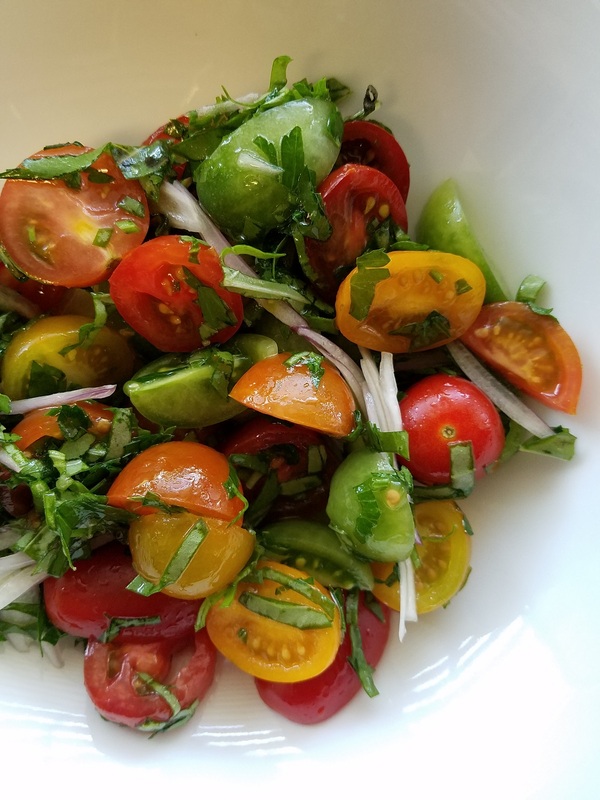 This would make a perfect accompaniment for any grill or pool day, brunch, picnic.. basically anywhere outdoors in the Summertime, this salad is for you. It's so refreshing and with only six ingredients this salad can be prepared in less than 5 minutes! More time by the pool, less time in the kitchen. Pairs perfectly with anything grilled, or sweet. Tip: To make this in even more of a time crunch, you can serve tomatoes whole instead of halved as long as they are bite sized.. Now that's freakin' simple. Place all ingredients into a bowl, season generously with salt and fresh cracked black pepper. Gently stir with spoon or spatula. Allow to marinate for 5 minutes. Enjoy! This is classic French Mustard Vinaigrette salad dressing is perfect over any simple green salad.. Separate the lettuce leaves. Tear the largest outer leaves in half, leaving the smaller leaves whole. Wash, rinse and dry the lettuce. In a large salad bowl, whisk together the shallot, vinegar, mustard, honey. Slowly drizzle in the olive oil and whisk to make a vinaigrette. Season with salt and pepper. Add the lettuce, chives, tarragon and parsley and toss well. Serve immediately. Serves 4 to 6. Have you ever ordered a $15.00 wedge salad from a restaurant and you end up with a chunk of iceberg with some ranch on it? I have, and oh, how disappointing it can be. 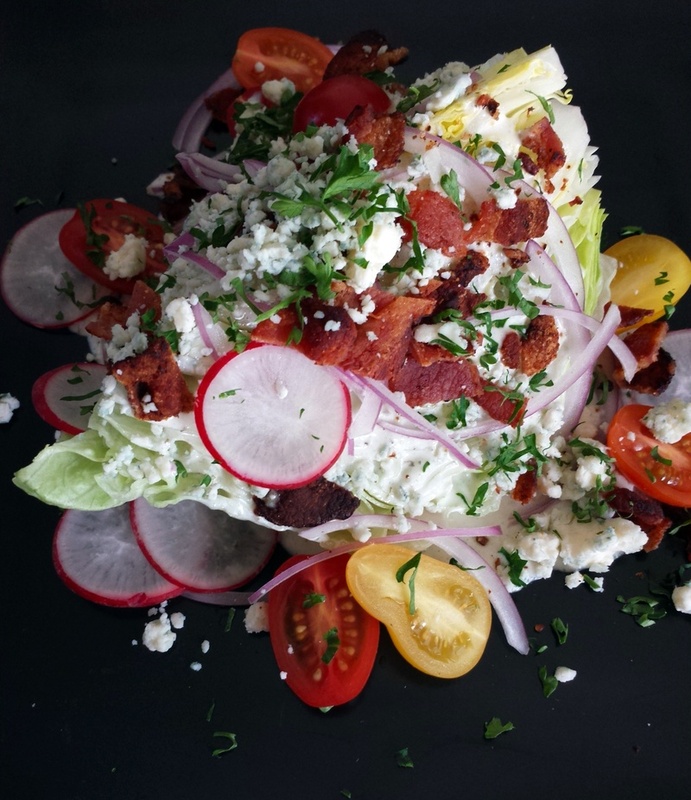 My recent wedge salad let down left me craving a real, satisfying wedge salad with toppings galore.. This is when The "Ultimate" Wedge Salad was born. The best part about it? Besides bacon, it can be made in under 20 minutes. In a blender, blend ranch dressing, bleu cheese, shallot and water until smooth. Season with salt and freshly cracked black pepper. Green Goddess Dressing is a thick, creamy dressing made of sour cream, mayonaisse, herbs and lemon. I have made a "healthier" version of this classic dressing by substituting avocado for mayonaisse. I personally think it tastes better, and it will give you a rich, green dressing without the added mayonaisse. You can also use this dressing as a dip! 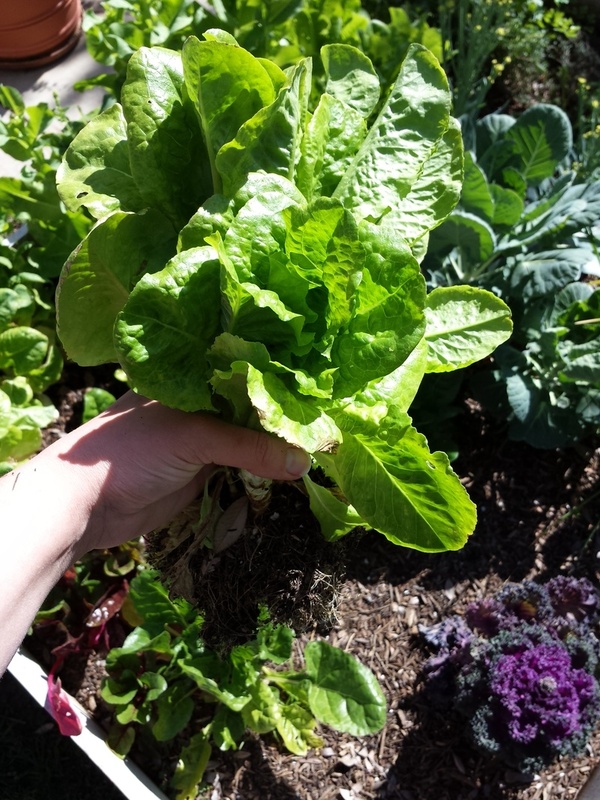 Baby Buttercrunch Lettuce from my personal garden. In a blender add 1/2 avocado, garlic, sour cream, scallion, basil, tarragon, parsley, anchovy, lemon and a dash of salt and pepper to make your dressing. Blend until smooth. Season to your taste. If you would like your dressing a bit thinner, add 2 tablespoons of water and blend until smooth. Re-season. On a large plate, pour a smal circle of dressing onto the center. 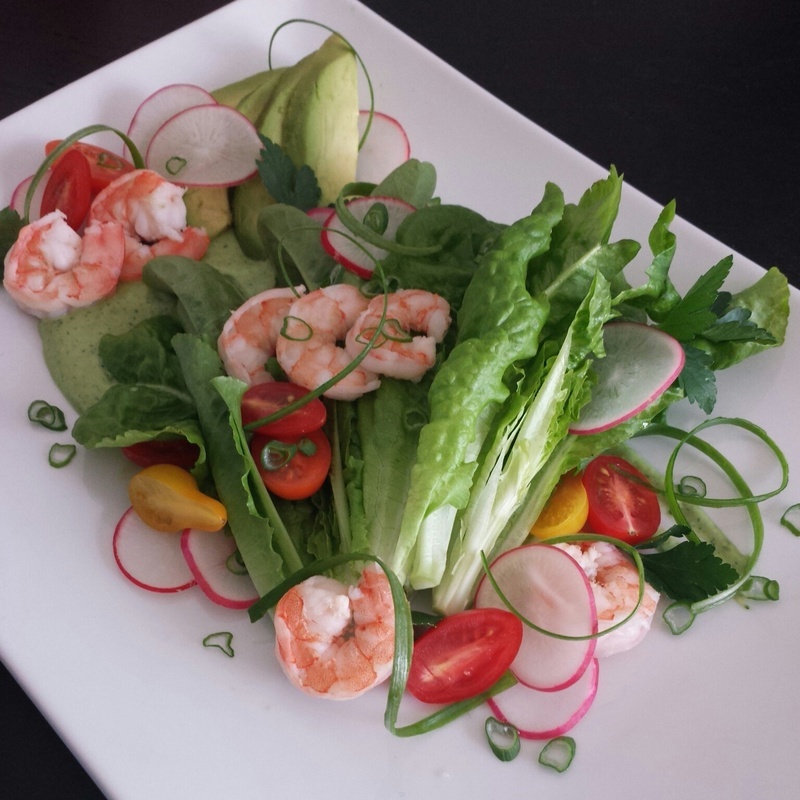 Top with lettuce, shrimp, sliced avocado, tomatoes and radish slices. Garnish with parsley or chopped scallion. Not into shrimp? Other great protein packed toppings would be cooked salmon, hardboiled egg or bacon. Yum! 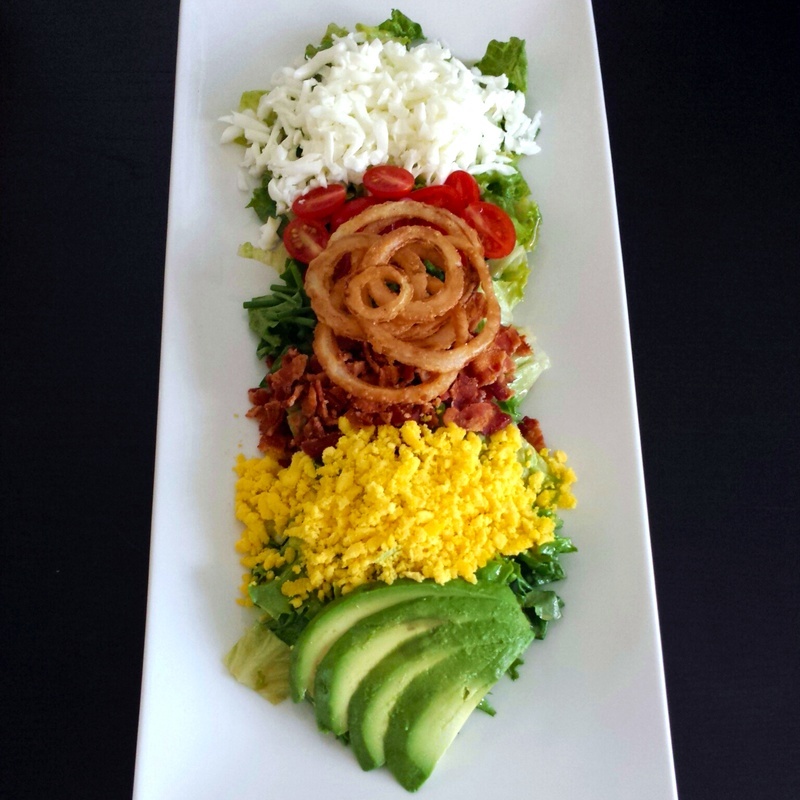 This California Cobb Salad is one of the first salads I learned how to prepare as a garde manger cook. It is a great stand-by because you almost always have the ingredients on hand and it will fill you up without weighing you down. Separate hardboiled egg yolks from egg whites. With a grater, grate both the yolk and white individually. Keep separated until time for assembly. In a small stock pot, add vegetable oil and heat over medium heat for 3-4 minutes or so to fry onions. If you have a thermometer, it should reach a temperature of 325 degrees. Use caution to not overheat oil as it can catch fire. If you ever see oil smoking, remove from heat until it has cooled a bit. If your oil should ever catch fire, *do not* add water to to the pot, this will create a crazy water/oil explosion. Carefully, take the pots lid and place it over the pot to extinguish flame. Place your sliced onions in a small bowl and cover with half and half. Let sitfor 2 minutes or so. Remove onions from half and half and place them into flour until coated thoroughly. Once your oil is up to temperature, drop in one test onion to see how the rest of the batch will cook. Cook onions 3 or 4 sliced rings at a time as not to overcrowd oil. When cooked place on a paper towel to drain and season with salt. Make as many or as little as you want, or you can omit this step completely. In a small mixing bowl, whisk dijon and mustard until incorporated. Then whisk in red wine vinegar. Once incorporated, slowly whisk in olive oil. It will make a thick yummy dressing. If the dressing is too thick for you, add a small amount of cold water until desired consistency. Season with salt and pepper. Now you're ready to assemble! 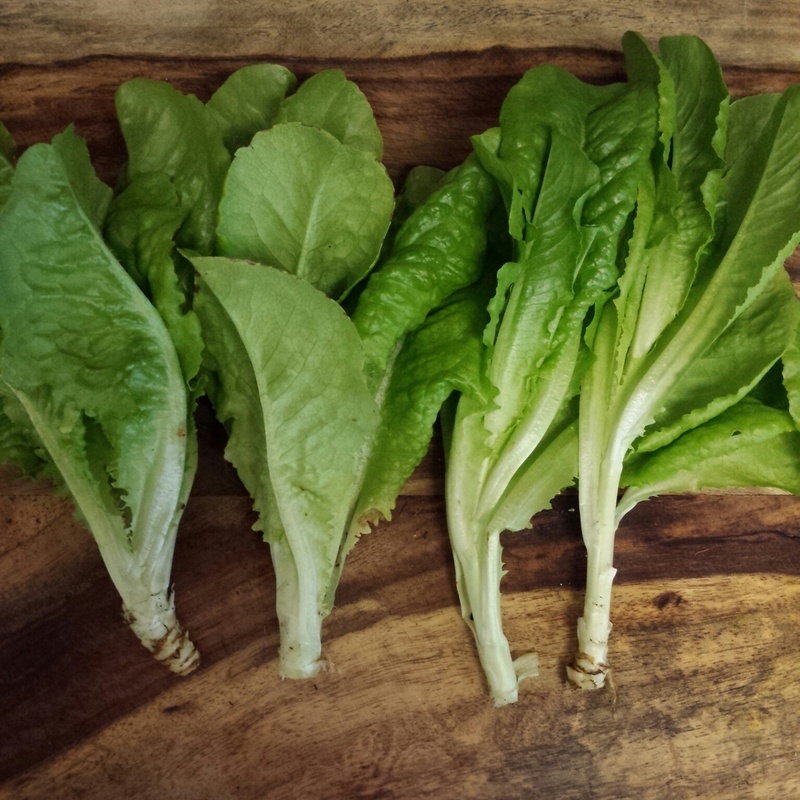 Dress the green leaf lettuce with the dressing then place an equal amount of salad into 4 long plates. Then, you are free to place topping on the top in whatever order you wish, but you can use my photo for reference. Top with fried onions, and enjoy! 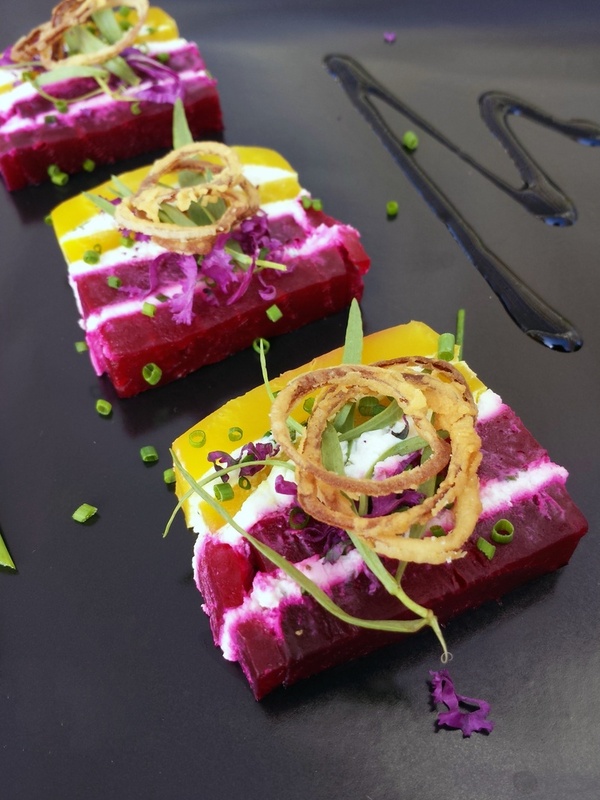 This vibrant Roasted Beet and Herb Goat Cheese Terrine with Fried Shallots can be made hours or days ahead of time. I personally love a broken balsamic vinigrette, or balsamic reduction drizzled over this, but a teaspoon of a really great extra virgin olive oil would be simply fantastic. Pre-heat your oven to 375 degrees. Line a medium sheet pan with aluminum foil. Take beets and place them on cutting board. Cut each root end and top off of each beet. Wrap each beet in alumium foil and place on foil lined sheet tray (this will save you a lot of clean-up later). Roast beets for 45 minutes. 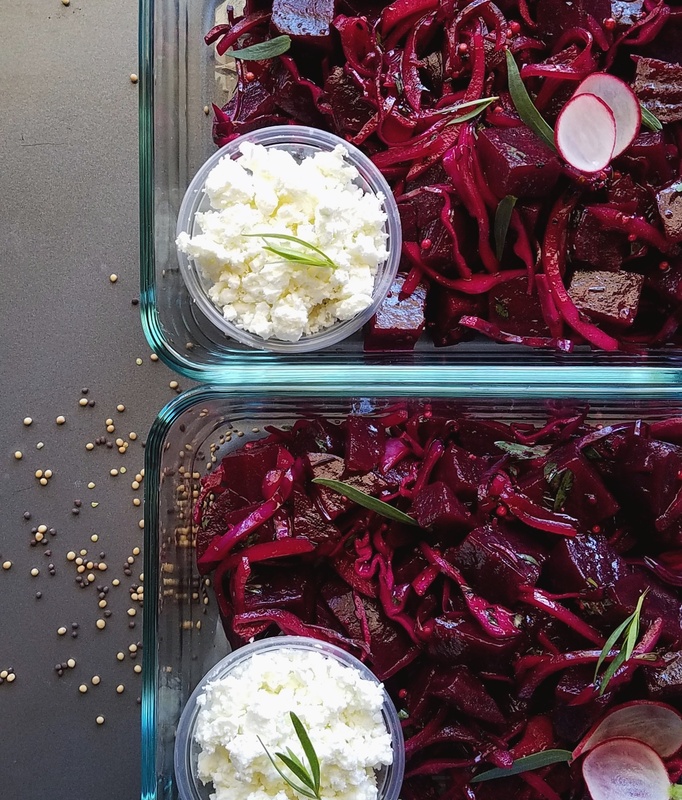 While the beets are roasting, in a mixing bowl, add goat cheese, tarragon and chive. Mix until incorporated thoroughly. Put goat cheese mixture to side until ready to assemble. In a small saute pan, add vegetable oil and heat over medium heat until 325 degrees. Mix shallots with milk in a small mixing bowl. In another small mixing bowl, add the flour. Remove shallots from milk mixture and dredge in flour. Once vegetable oil has come to temperature, carefully add shallots to pan. Be sure to flip and cook evenly until golden brown and crunchy. Remove from oil and allow to dry on paper towels. When your beets are done, you will be able to easily insert a toothpick into them without resistance. Remove foil from beets and allow to cool. Hold beets until cold running water and gently pull off their skins. Discard the skins and dry your peeled beets with a paper towel. *Note, red beets can cause staining of clothes, tile etc. use caution. Once your beets are cool and dry, slice them into 1/4 inch slices. Line an 8x8 glass dish with saran wrap. Start with one layer of red beets. Top with 1/3 of the goat cheese mixture. Just add large crumbles, it does not need to be perfectly spread. Just make sure there is an even amount. Repeat this process again with another layer of red beets, then two layers of golden beets. 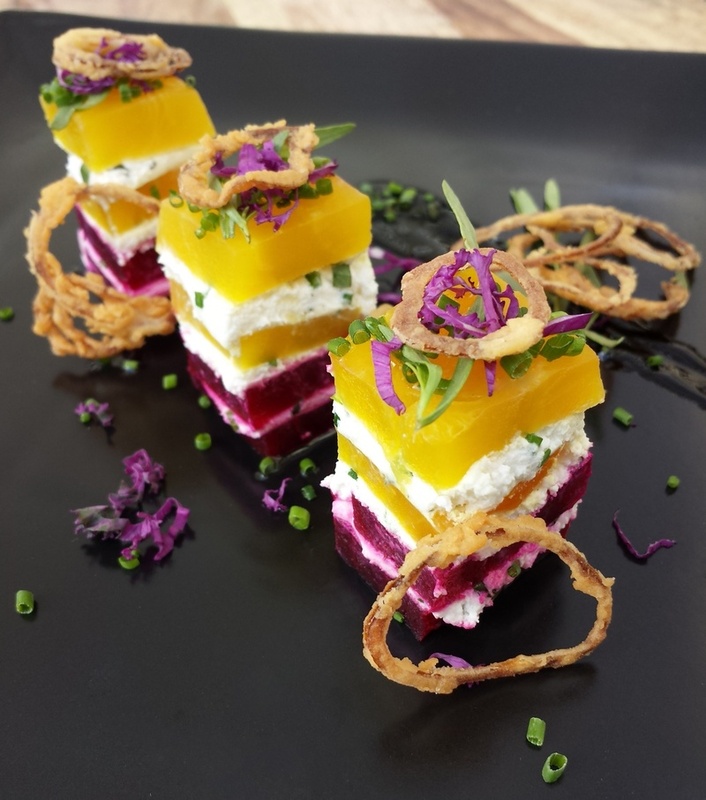 Red Beet | Goat Cheese | Red Beet | Goat Cheese | Yellow Beet | Goat Cheese | Yellow Beet. Top with final layer of saran wrap, and add a flat heavy weight on top, like a book with a brick on top to "press" the terrine. Place in your refrigerator for 1 hour to 1 day. When ready to serve, remove terrine from dish by placing cutting board on top and flipping over. Remove plastic wrap, and slice. You can have thick or thin slices, small hors d'oeuvre size cubes, cut it however you like. Season with Himalayan pink salt, a small drizzle of extra virgin olive oil and garnish with tarragon sprigs or chive. 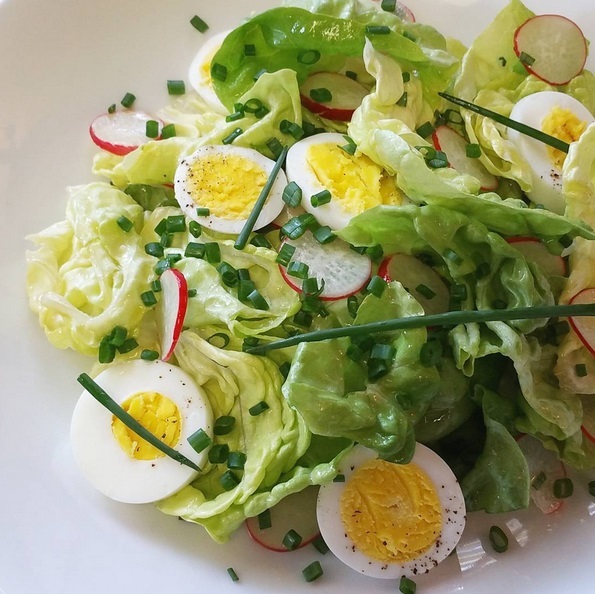 This sophisticated salad is a French classic that is sure to impress any dinner guests. If you cannot find frisee in your local super market, purchase a bag of mixed greens that has frisee in it, it will do just as well. Pre-heat oven to 425. Fill a medium sauce pot full of water, put over high heat and bring to a rolling boil. Place asparagus on a medium sheet tray and top with olive oil and one teaspoon salt. Bake at 425 for 10-12 minutes until tender. While asparagus is in oven, put 4 slices of bacon into medium skillet over medium heat, cook until golden and crispy. Crumble bacon into large pieces and reserve for plating. In a small bowl, combine lemon juice, lemon zest, 2 tablespoons extra virgin olive oil, 1 tablespoon honey and a dash of salt and pepper. Whisk ingredients until incorporated, put to side. Add 2 tablespoons cider vinegar to boiling water. The vinegar will help keep your poached egg intact. Bring boiling water down to a low simmer. Gently crack each egg into hot water. Let eggs poach for 2 minutes until whites have become opaque. Gently "flip" eggs with a spoon or spatula. Continue cooking eggs for 3-4 minutes. Once whites are completely opaque, gently remove eggs from water and allow to dry on a paper towel. If you like your eggs cooked more than over medium, continue cooking until yolks are firm. In a small mixing bowl, mix frisee or mixed greens with lemon dressing. Grab a clean plate and place asparagus down first. Top with dressed frisee and bacon crumbles. 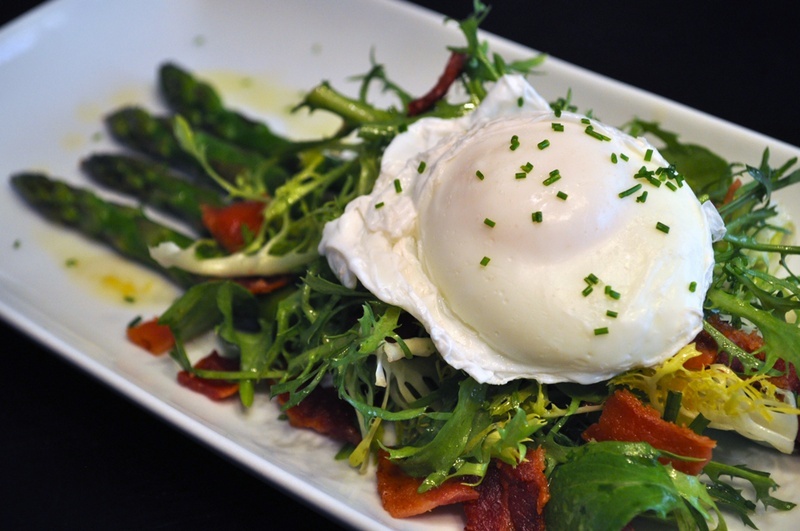 Top mixed greens with poached egg. Garnish with scallion or chive. Enjoy! The strawberries and apple cider vinegar in this salad dressing are packed with powerful antioxidants which can protect your cells and body from being impaired by free radicals like: pollution, stress, chemicals, pesticides, inadequate diet, etc. 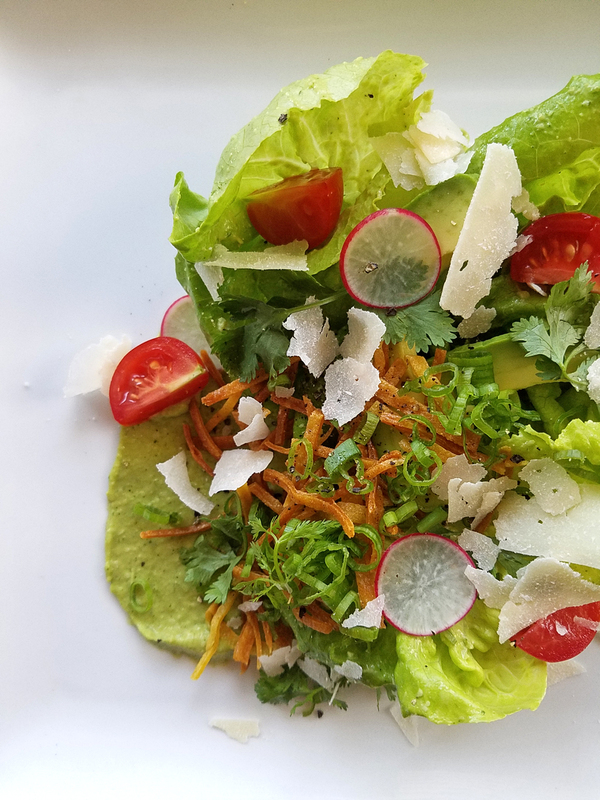 This nutritious and delicious salad is also great when served as a starter or a side to any grilled meal. Place all dressing ingredients into blender and blend until smooth and incorporated. 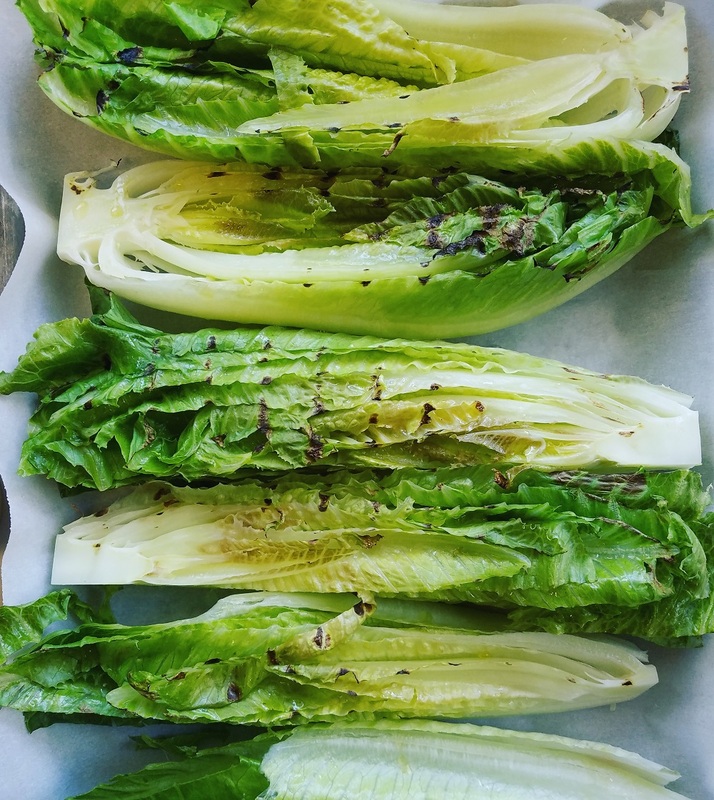 Dress romaine lettuce with 2/3 of the dressing and place into large serving bowl or individual plates. 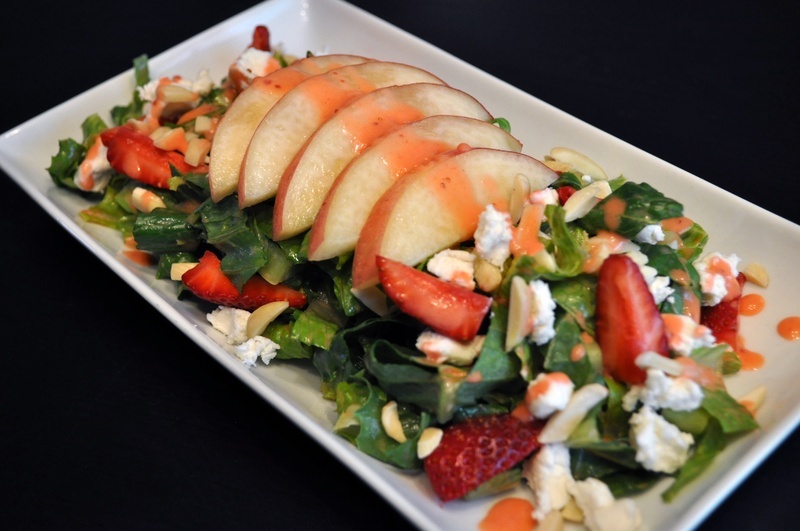 Add peaches and strawberries into salad, and drizzle remaining dressing over the top. Finish with almonds and goat cheese. The smoky flavor of the fire roasted Poblano peppers in this recipe pairs spectacularly with the earthiness of the beets. You can roast the peppers and the beets ahead of time; just make sure they stay separated. 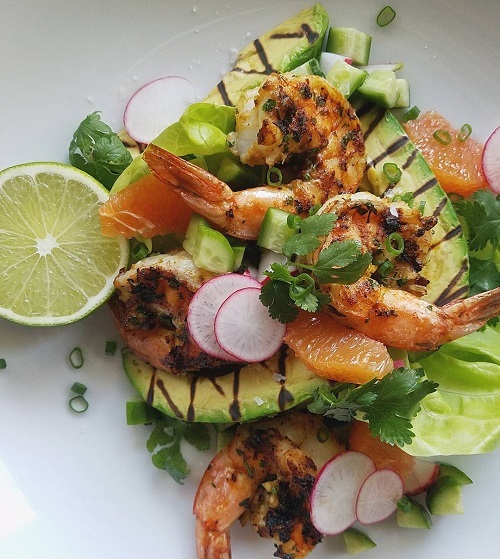 Serve this dish at room temperature, or chilled with lots of fresh cilantro. Preheat oven to 375. Cut roots and ends off of beets. Beet juice can dye clothing and surfaces very easily so use caution. Wrap each beet in aluminum foil and place on baking sheet in oven. Roast beets for one hour and check for doneness. Stick a toothpick or fork into beet, if there is no resistance, your beet is cooked. Allow beets to cool. Take whole Poblano pepper and roast over open flame or place under broiler in oven until skin is black and blistered. Always use caution when working with an open flame. Put roasted pepper into a plastic bag or a bowl with a lid to “sweat” until soft. Once pepper is soft, remove charred skin by wearing a glove. Remove stem and seeds from pepper with a knife, chop pepper into small chunks and hold in your refrigerator. Once your beets have cooled, remove their skins by hand by wearing a glove. Once peeled, cut beets into uniform 1 inch cubes. Hold beets in refrigerator until ready for use. To make your dressing, simply whisk lime juice, honey and salt and pepper together. 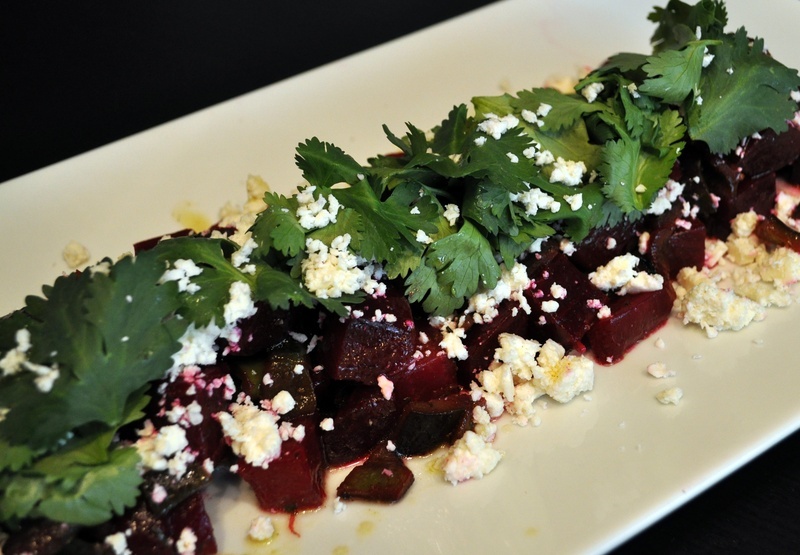 Remove beets and peppers from fridge and toss with dressing. Toss in ½ of the cilantro leaves and serve in a plate or bowl. Top with crumbled cotija cheese and remaining cilantro leaves.